Check-in/Checkout Kiosks are available in the hotel for fast service and are located on the 2nd floor of the hotel, near the Callaway golf shop. The hotel fitness room & indoor pool are now open! The fitness room is open 24/7 and the pool is open daily, 5am-11pm. 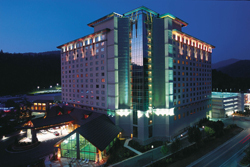 When you want casino action, visit Harrah's Cherokee Casino for video poker on over 850 poker-based games. Choose from Double Double Bonus, Jacks or Better, Deuces Wild, Bonus Draw, Three Card Poker, Let It Ride and many others in variations ranging from nickels to $100 denomination machines. Our ever popular Pot O' Gold games include, Black Gold, Eight Ball Poker, Shamrock 7's, Triple Sevens and more. Video gaming at Harrah's Cherokee Casino Resort offers Las Vegas style slots with over 600 games in denominations from five cents a spin up to $100! The most popular video gaming themes include Five Times Pay, Cats N Dogs, Triple Bonanza, Triple Diamond and Wild Cherry. When you want casino action, try one of our Harrah's Cherokee video gaming favorites like Wheel of Fortune, Blazing 7's, Coyote Moon, Whales of Cash, Triple Diamond, Triple Stars, Triple Blazing 7's Double Jackpot, Gold Fish, Monopoly and Triple Lucky 7's. Pizzeria UNO Express offers hand-crafted thin crust pizzas and calzones and daily fresh pasta dishes. The BRIO Tuscan Grille bringing the pleasures of the Tuscan country villa to Cherokee, chef-inspired Tuscan recipes at BRIO are sure to tempt your palate. Winning Streaks Deli, featuring Boar's Head meat, offers a selection of hot and cold sandwiches and delicious paninis. Johnny Rockets brings a great American taste to our food selection with breakfast sandwiches, classic burgers and fries and famous milkshakes. The newly opened Selu Garden Cafe restaurant offers some favorite dishes along with an all-you-can-eat bar at breakfast, lunch, and dinner. The Harrah's Cherokee Noodle Bar is a casual Asian restaurant serving dim sum, noodle soups and house specialties. Overlooking Soco Creek, Lobby Cafe is conveniently located on the first floor of Creek Tower and is a perfect place to meet friends or just relax and refresh. Dunkin' Donuts Express, an America's favorite every day, all-day stop for coffee and baked goods! On the casino floor, in the new food court. Chefs Stage Buffet is a buffet at Harrah's Cherokee, featuring chefs' specialties prepared at interactive stations that are sure to please any diner. Ruth's Chris Steak House serves only the finest USDA Prime steaks, broiled at 1800° & served sizzling on a 500°plate, at this fine dining restaurant at Harrah's Cherokee.